Odin, the dark one, is 1 and Loki, the white one, is almost 2. 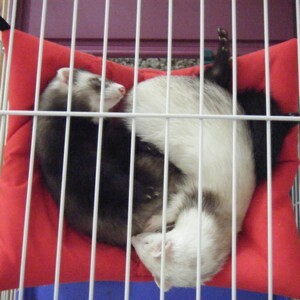 They are Ferrets. I got Loki for my birthday and I got Odin as a playmate for her year later. They love to hide their toys from one another, steal my balls of yarn while I am knitting or hide in my yarn bag. They like eating their favorite treats. They are the most hilarious pet I have ever owned and I never regret getting them and I would recommend that anyone that wants to adopt a "fuzzbutt" to please research and research some more. It is a commitment that isn't for everyone. I have a ferret, or more correctly, my husband bought a ferret and all accessories needed thanks to the Obama Stimulus check. I have had them before and he wanted to have one so I got cage off of freecycle.org and then we fixed it all up with linoleum patches and blankets and the furovite that makes up for the fatty acids that few foods have...and then we got a hammock and walla, a little girl who rejected her ferret name of Sugar and only comes to the words "Where's the Weasel!" Such a sweet darling little pet...not a cage animal at all, but I make her go to her cage to get rest. She has been so active lately. We like to watch her hide things away, especially any kind of cellophane noisy making thing. She has a stash and has been keeping it for years, and I have been cleaning it out for years, and it hardly bothers her at all. It is so true, when she see's us for the first time in the morning, she hunches her back and jumps backwards, then sideways, then forwards, with her mouth open and laughs, only a ferret owner knows how funny this is. To be owned by a ferret, is one of the supreme joys of life. 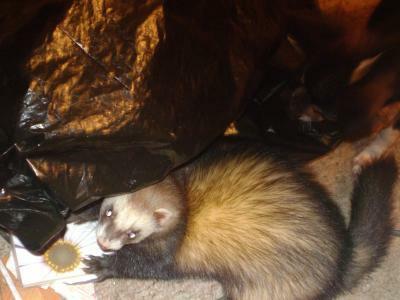 Of course, I didn't box train my ferret, she goes in the corner of the cage where I put linoleum squares and I pick it out with a baggie every day. It is easier that way, but when she is wandering through the house, she will stop by the cat box and go...so adorable. I keep calling it a "He" even though it is a she, and she loves life so much! I had ferrets for 12 years. I had six total, four at any one time. I miss them terribly. But in the US most ferrets are Marshall Farms ferrets and usually have congential diseases which will appear when the ferret is a few years old. If your ferrets have tatoos in their ears, you may have thought it was a birthmark, please watch them carefully for signs that all is not right. In the meantime, enjoy them! They are lots of fun and their mischievious antics always made me laugh. I sincerly hope your ferrets remain healthy. What Kind of Pets Do Ferrets Make?